My talented friend Trish Williams was interviewed by Bonnie McCaffery when she was in Chicago for the International Quilt Festival. 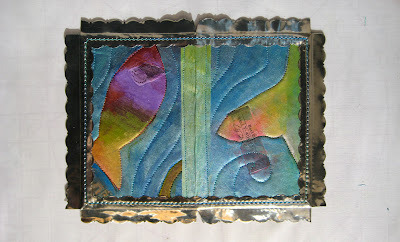 Go see this great interview with lots of images and descriptions of Trish's quilts. 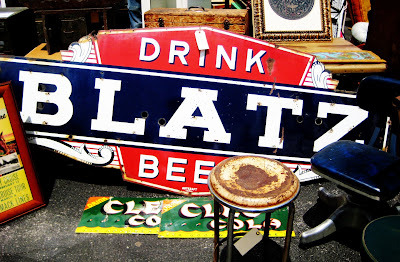 Today was the opening day of the Chicago Antique Market. We are lucky to be able to walk to it, about 5 blocks west of our loft. It's the perfect weather today, about 70 and partly cloudy. I am glad we are still enjoying cool weather here, poor Northern California has had unnaturally hot weather, and the beautiful Santa Cruz mountains are burning up from it. Abby came with us, tucked into her bag so she can people watch without being stepped on. 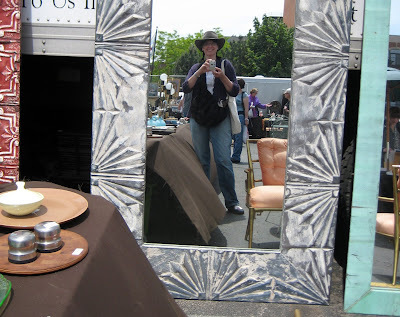 You can just make out her head peeping out of the bag in the photo I took in the mirror. 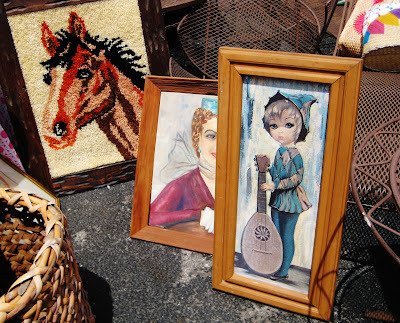 Boy, does this capture the 70's or what, a big eyed harlequin waif painting and a framed hooked rug horse. 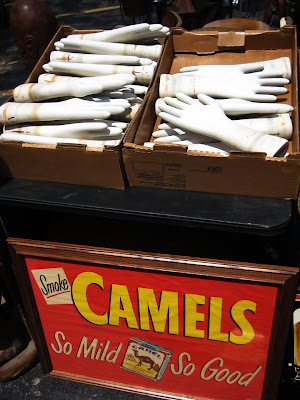 I love these glove molds, one of these days I may have to buy one. 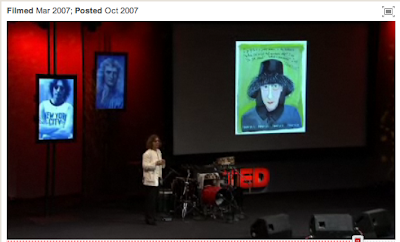 Another Ted talk worth watching (although I think they are all fabulous and am trying to watch them all) is this one by Maira Kalman. I love the way she paints and tells a story. We read all her children's books when my kids were little. 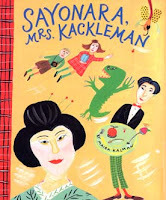 Sayonara, Mrs. Kackleman had to be one of our all time favorites. This description from From Publishers Weekly describes the book perfectly. While watching a performance of The Mikado , Alexander suggests to his older sister Lulu that perhaps they should visit Japan. Lulu, eager to avoid her piano lesson and her teacher, the dreaded Mrs. Kackleman, is only too happy to agree. The two arrive in Tokyo (without parents, you understand), and are bundled off in a red taxi driven by a gloved man with "sharp black hair." Images of houses and people, food and customs jumble together in a wild stream-of-consciousness travelogue that springs from the minds and lips of the irrepressible brother and sister. A man sitting on a park bench and a frog in a kimono reciting a haiku are as riveting as a visit to a Japanese school or communal bath house. The book is studded with many gems from the mouths of Lulu and Alexander, like the poem dedicated to their guide: "Hey Hiroko, are you loco? Would you like a cup of cocoa?" 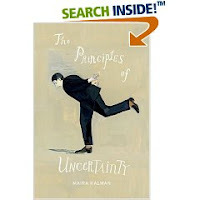 Kalman's Latest book The Principles of Uncertainty began as a year long blog for the New York Times. I own this book but I was thrilled to find the whole blog with all the paintings here on the New York Times website they way they were originally posted. Chicago School of Fusing May birthday lunch. 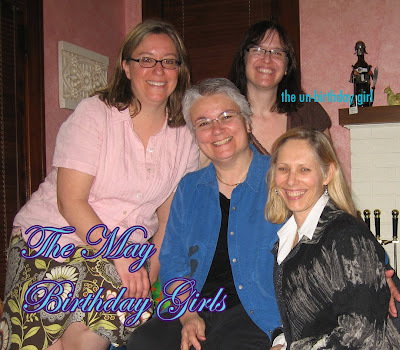 This week I took a trip out to the suburbs to have lunch with Frieda, Laura and Emily who all have birthdays in May. My morning began by hailing a cab to get to the train station. Chicago cabs are very motivated when they see potential fares. It feels like life slows down outside the city, it's a nice change. Emily and Laura coming up from Laura's redesigned studio featured in this months Quilting Arts. Great company, a delicious lunch and sharing ideas, a wonderful way to spend the afternoon. 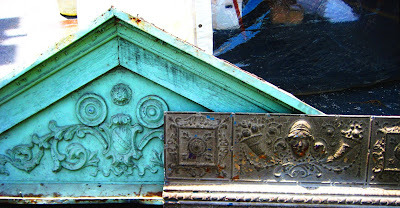 Check out a cool blog called Layers Upon Layers. 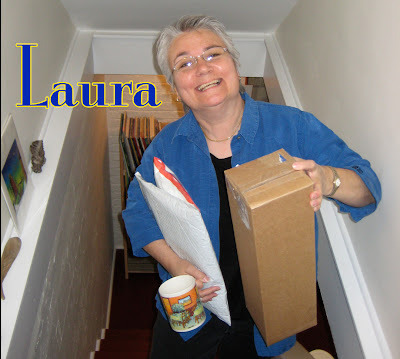 Each week Cyndi does an interview with a different artist, this week she featured me! There are always interesting techniques, artist profiles and links to other cool stuff on this blog. Thanks Cyndi! This is one of my favorite house views not seen in the magazine. In this months Cloth Paper Scissors magazine you can find the directions for making my Dream Houses also referred to as the bird houses. There are a lot of steps to making these and in fairness to the other contributors of the magazine only so many pages could be devoted to my article and as a result the photos included in the article were fairly small. 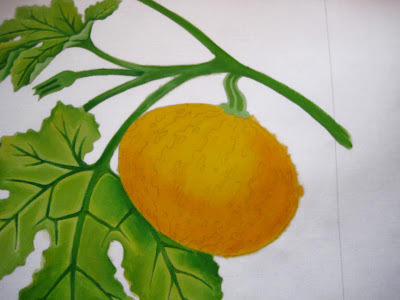 So I thought I would give you some nice big detailed photos to see the process. In this first photo you can see I use a ball stylus to mark the metal. 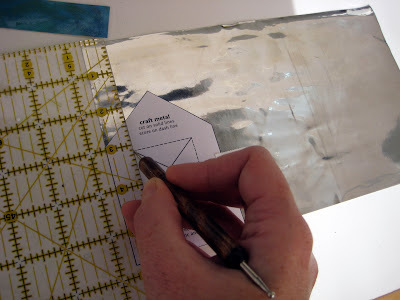 Light pressure will score a line through the paper, so it is easy to see for cutting. I use firm pressure to score lines that I will be folding. 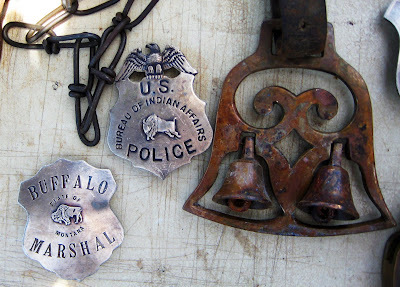 The metal cuts easily with an x-acto knife. 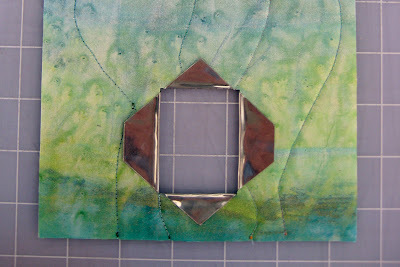 cut once with moderate pressure and wiggle the metal back and forth in your hands and the cut line will separate. 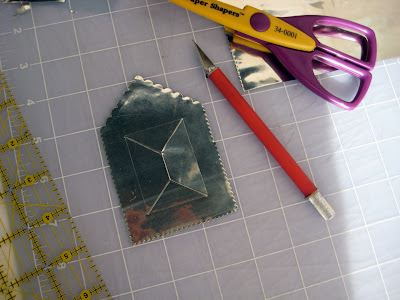 After cutting the basic house shape the outside edge is trimmed with decorative craft scissors. 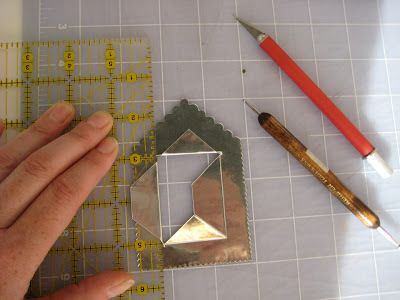 To fold a straight line fold the metal up against the edge of the ruler. 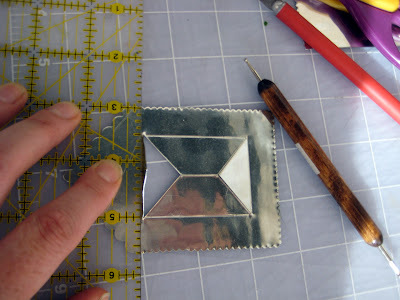 The ruler is about the same thickness as the Peltex used in making the house, so I fold the metal over the edge of the ruler on all four sides of the opening. Then I gently straighten the edges up and fit it through the door hole cut in the house then fold the metal flaps flat against the inside wall of the house. 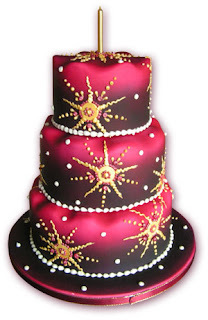 The metal sews easily, it is very soft. 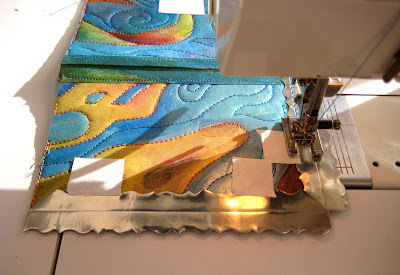 Lengthen your stitch length and sew slowly. I use the ball stylus to draw on the metal, free form doodles. Scoring a line that echoes the decorative cut edge is always a good place to start. Then fill in with dots, lines and zigzags. I sew all the house walls together working left to right, stitching over a fused strip of painted fabric to reinforce the hinge. 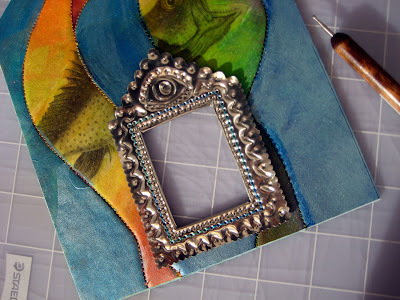 This is my high-tech way of using an iron for fusing a 3-dimensional piece. 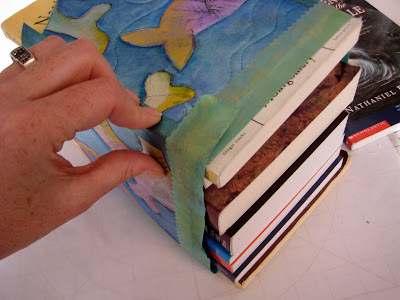 Find the right combination of paperbacks from the library to fill the space, so when you iron the top edge you don't squish the structure. 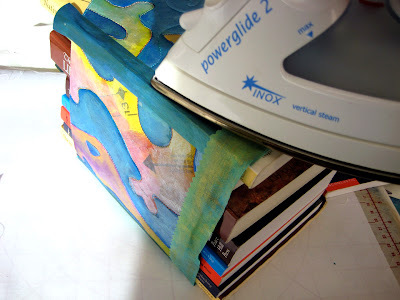 Always put a press cloth over the painted surface before ironing, this is a cold iron for the photo. I tape the metal strips in place on the roof and sew adding each metal strip just before I get to it. After sewing the metal on the roof, I emboss it and fold the edges down to fit over the house. Finished houses ready for roofs. I always like to make sure there is something to catch your eye when you look through the door. In Living the Creative Life, author Rice Freeman-Zachery has compiled answers to these questions and more from 15 successful artists in a variety of mediums--from assemblage to fiber arts, beading to mixed-media collage. Creativity is different for everyone, and these artists share their insights on the muse (if you believe in her), keeping a sketchbook (or not), and prioritizing your art, whether you aspire to create solely for your own pleasure or to become a full-time artist. * Try your hand at creative jumpstarts straight from the pros. 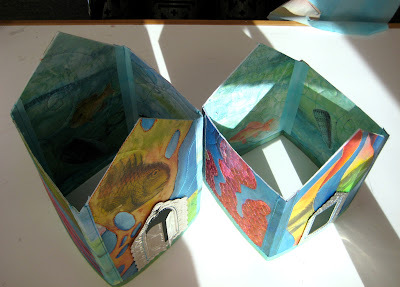 * Glimpse the artists' innermost thoughts and works in progress as you peruse pages from their journals and notebooks. 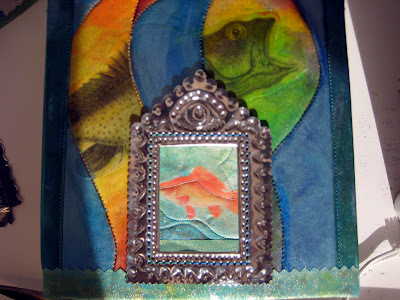 * Share textile artist Sas Colby's triumph over creative block during an exotic art retreat. * Learn how internationally acclaimed artist James Michael Starr uses experience from his former "day job" to fuel his creation today. * Explore the work of Michael deMeng, Claudine Hellmuth, Melissa Zink and the other artists right alongside their insights. No crafter or artist should live the creative life without Living the Creative Life! The inspiration is contagious. Rice was recently invited by Google to give a talk on her book in their authors @google series. This is an excellent talk and gives you a real taste of what the book is like. A blow dryer can be a great tool to have on hand when you are painting. 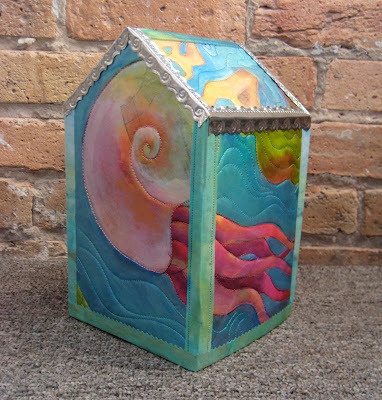 When you are glazing paint you want to build up the color gradually, the paint needs to dry between layers. This is really important if you are glazing several colors on the same area, if the layers are not dry the colors will mix and get muddy and you will not have depth in the color. 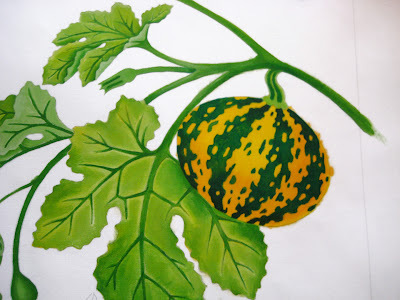 Next I painted the dark green on the squash and glazed a darker shade of green at the top and bottom of the squash to increase the illusion of it being dimensional. 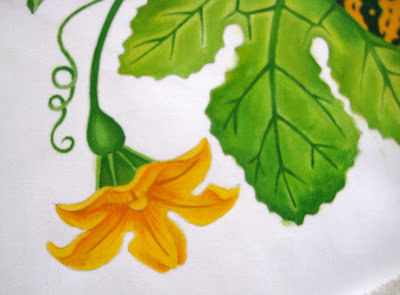 The blossom is painted a similar golden yellow with a tiny bit of red added to the yellow to deepen the color. 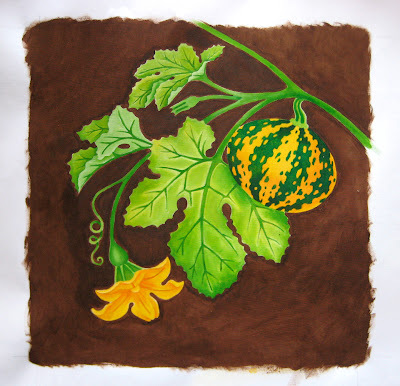 I painted the background with Jaquard brown (not neopaque) straight from the jar. I liked this initially but after a couple days when I came back and looked at it, the splotchiness bothered me and I felt like the flower did not have enough range in value, it looked a little flat. I think it is always good to set work aside and come back and look at it with a fresh eye. You will often see things that were not apparent before. 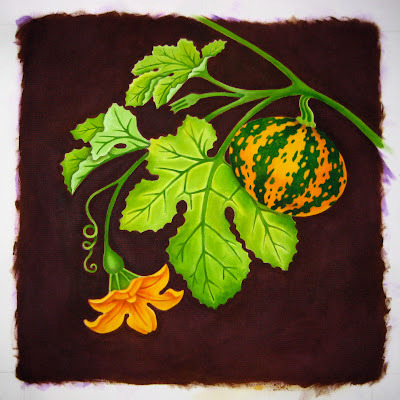 Using only violet paint, I glazed light washes on the flower in the center and in the shadows where the petal curls to give it more depth and I glazed light washes on areas of the leaves where there is some overlap to give them a little more definition and in a few places on the stems to give more dimension. Then I painted the whole brown back ground with medium to dark glazes of violet multiple times, this evened out the background and warmed it up to an aubergine tinted brown. Purple is the compliment of yellow, adding it to the background creates more contrast with the the colors of the plant making it pop and come forward from the background. As I have thought about teaching painting workshops, it has brought to mind how useful a class in color theory could be for people who are interested in learning more about the role of color in their work. It would really help in learning to mix color for painting and to understand what happens to one color when you put another color next to it. 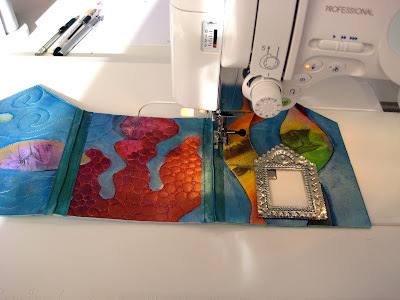 I am wondering if it would be worthwhile to create a workshop for this that could coincide with fabric painting, any thoughts? It would need to be 6 hours to cover the basics of color theory, would this be something you would consider taking the day before a painting workshop? 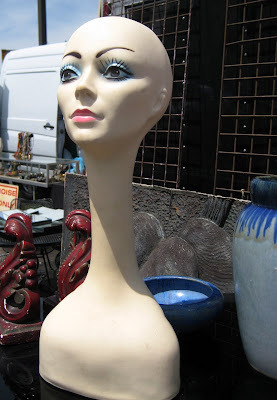 My friend Julaine left a comment mentioning her site meter will soon be hitting 10,000 (go visit she has a prize for the lucky 10,000th visitor). 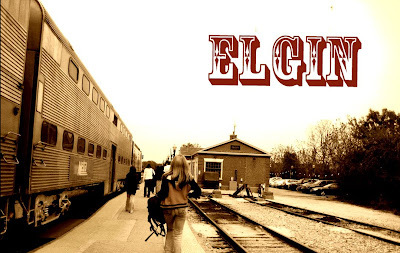 Thinking about this type of blog land mark made me realize I have now had my blog 3 years! That is amazing to me. Since I was a teen I have tried and failed to keep a journal numerous times. I just didn’t like writing that much, especially to myself. What did I have to say, that I didn’t already know? I would much rather draw pictures and make things. Now I see my blog has become what I never realized a journal could be, a place to document my art and share it with others. 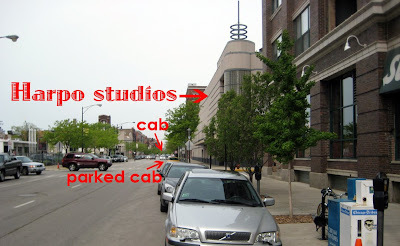 I have found the blog is a great resource for me to turn to on past projects. It is funny how many details one can forget, I guess this is one of those things that is not going to get any better with age. 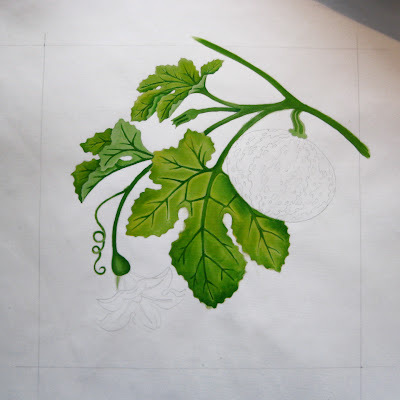 There have been many times (yesterday, as a matter of fact) that I needed information about a particular piece of artwork; size, materials or process and I may think I remember everything until I go back and look at the blog post and lo and behold I have forgotten a couple crucial details. 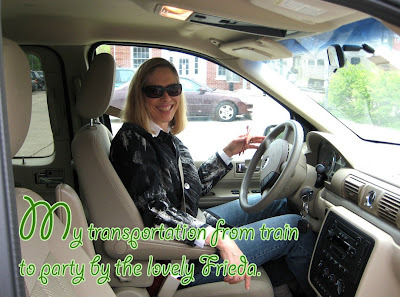 Through the blog I have learned so much from people. Several years ago people asked me if I taught workshops and I had to tell them no because I really didn’t know what I should teach. When people ask me questions on the blog about how I work and what products or tools I use I realize what people would want to learn from me. I appreciate this kind of feedback so much. This has really helped me move forward with taking the plunge into the world of teaching and WRITING! 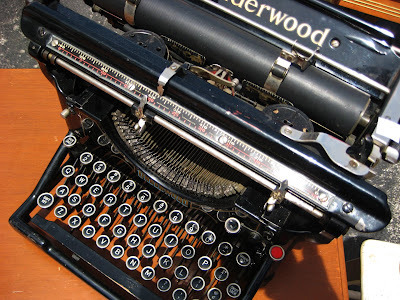 You have no idea what a block I have had about writing, I would not have believed it possible a few years ago if some one told me that I would be writing magazine articles. 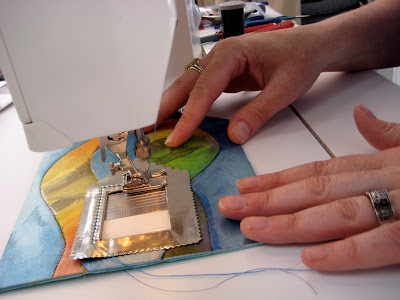 Now I have written seven articles for Quilting Arts and Cloth Paper Scissors! I won’t even go into how unfathomable the whole Quilting Arts TV thing is. If you know anything about panic disorders you will realize how huge that is. There is nothing like facing your greatest fears to work through them. 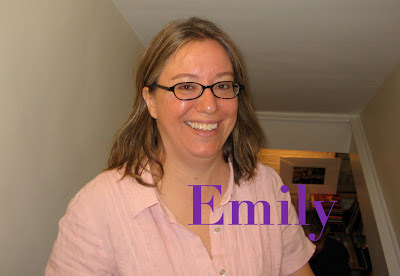 One of the best things about having a blog is making connections with people from all over the world! I love that we can share our ideas, experiences and images with each other no matter where we are. The world is now our neighborhood, and we can go door to door and visit every day. 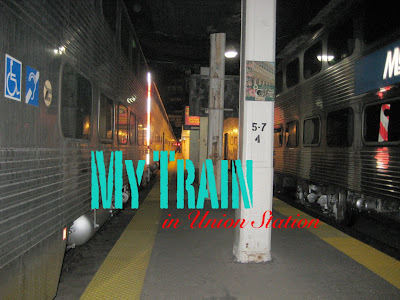 I would like to say thank you to all of you who visit my blog and have actually read this far. Thank you!